Line a sheet pan with parchment paper. Heat oven to 350°F. Zest one orange into a small bowl, reserve. In a large bowl or stand mixer, whisk cocoa, sugar and salt. In a glass measuring cup, combine egg whites and vanilla, then slowly beat into dry ingredients on low speed. Beat at medium speed for 2 minutes, until glossy. Mix walnuts and zest into batter. Drop scant quarter-cup mounds 3 inches apart on the prepared pan, and use a spoon to spread the batter out to half-inch thick cookies. Put sheet pan on the middle oven rack and reduce heat to 325°F. Bake cookies until thin cracks appear, about 15 to 17 minutes. Allow to cool completely before removing from the pan, peeling off the parchment paper if necessary. To assemble, use eight wine glasses or glass ramekins. Break each cookie into 4 pieces. Place one-third cup of yogurt mixture in each glass or ramekin, then add 2 pieces of cookie. 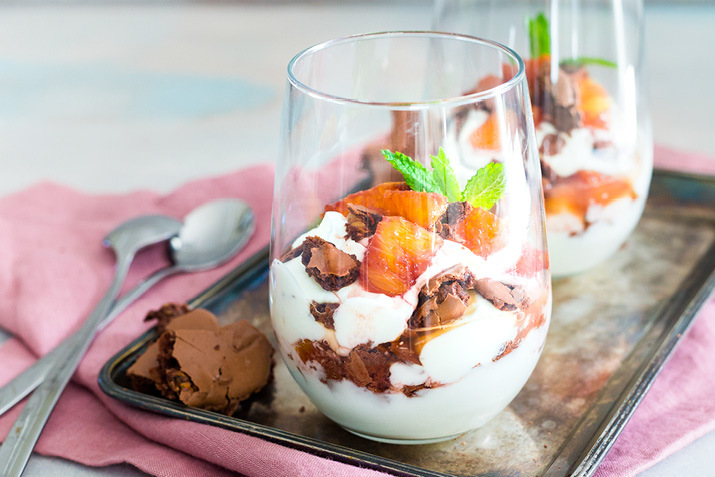 Top with another one- third cup yogurt, add 4 orange pieces and 2 more cookie pieces, then drizzle blood orange juice around the edge of glass. Repeat process.